Identifying alternative options for current utilization strategies. ONCOLOGIST DEBRA PATT BELIEVES THE AMERICAN SOCIETY OF CLINICAL ONCOLOGISTS’ RECOMMENDATIONS WILL IMPROVE CANCER CARE. 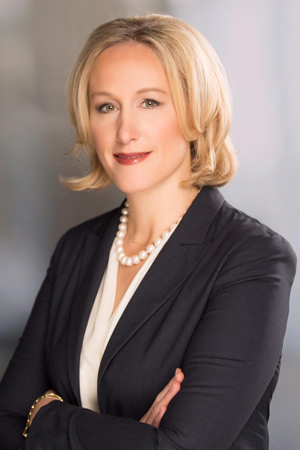 The American Society of Clinical Oncology (ASCO) is speaking out against the strategies that health insurers use to control the use of innovative therapies for cancer and other diseases and provides guidance for improving these strategies to improve patient care. In a policy statement published earlier this year, the organization said these strategies often block access to quality cancer care. Instead, the group recommends guidelines that are based on medical evidence and the best interests of patients. ASCO should be praised for stepping up and providing this guidance for improving cancer care. Following these guidelines will allow more cancer patients to get the right treatment without inappropriate barriers. Each cancer therapy has a unique combination of efficacy, safety and tolerability that may best suit an individual patient, according to a doctor’s determination. ASCO believes insurers’ strategies can often hinder doctors from giving patients appropriate treatments. These strategies operate under the false assumption that all cancer treatments are interchangeable. Sometimes there are therapeutically equivalent options, but that’s the exception, not the rule. Over the past year, I have seen a dramatic rise in the use of approaches meant to save insurers money, such as prior authorization, step therapy, specialty tiers, restrictive formularies and a lack of parity for oral treatments. These strategies are blunt instruments targeted at decreasing utilization. They can be aggressive and arbitrary. What cancer patients need are finer instruments that consider the complexity of cancer and allow appropriate access to therapeutic intervention. This trend isn’t stopping anytime soon. New cancer therapies continue to enter the market, and insurers continue to face pressure to keep cancer care costs down. These strategies are blunt instruments targeted at decreasing utilization. They can be aggressive and arbitrary. Prior authorization, in particular, has hindered patient care at Texas Oncology. A year ago, oncologists started chemotherapy the day after determining a patient’s treatment plan. Today, the wait time is up to a week before the practice can obtain prior authorization from the insurance companies. At times, approval has taken up to a month. It should take a couple of hours if all the information required to make the determination is available when the order is written. This process needs to be streamlined. Waiting for treatment to begin can be especially tough on patients, who are often afraid and want to get started as soon as possible. It’s in the best interest of patients to start treatment in a timely manner, not a month later. But we face delays and uncertainties in care with these policies today. Other insurance strategies also compromise cancer care. Step therapy forces patients to try and fail one therapy before getting access to another. Specialty tiers require a higher cost-sharing burden for cancer therapies than for other diseases. Formularies, the list of prescription medications covered by a plan, are not being developed with transparency or the appropriate clinical oversight. Finally, patients often have higher copays, coinsurance and deductibles for oral cancer therapies than for treatments given in a hospital, such as intravenous or other modes of injectable medicines. Instead, these insurer strategies should be based on evidence-based clinical pathways. This approach will ensure the appropriate use of cancer therapies and the best cancer care. ASCO’s statement galvanizes support for state and federal legislative proposals to protect patients from aggressive cost-reduction strategies. For instance, legislation introduced in Texas this year would ensure step therapy is only used when medically appropriate and offers protections for cancer patients’ treatments on Medicaid formulary. The policy statement advocates for approaches that provide the right care for patients at the right time. 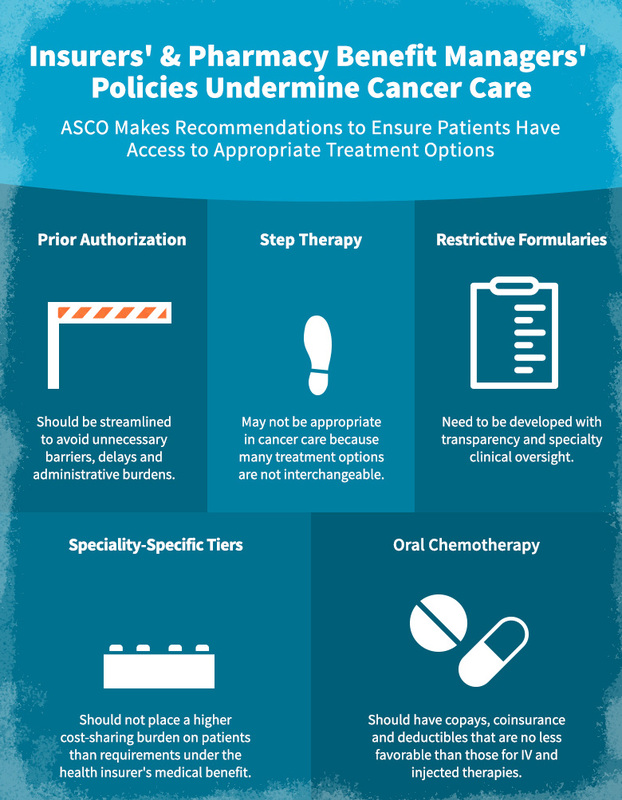 ASCO is trying to provide guidance to payers regarding how to manage a real, complex, and growing problem of managing utilization and cancer treatment costs while allowing the right care to the right patient. ASCO’s recommendations will help improve cancer care for patients as strategies like these remain a continuous challenge for doctors and the patients we serve.